A world-class international doctoral program, training the brightest minds. The "Doctoral track" (Master 2 ETE) allows students to acquire a thorough and advanced general training in economic theory (micro, macro and econometrics) before choosing a specific area of research. During this first year, students are also given training in research techniques and work one-on-one with a faculty advisor to complete a master’s thesis that will be assessed by a board of professors. At the end of the first year, students are admitted in the second year DEEQA on the basis of their results (courses and research work) and embark on a final year of advanced, specialized courses. Students should select 7 course topics among a list of advanced specialized courses and attend an annual research workshop (members meet on a regular basis during the year). At the end of this second year, students must present some original research work (a preliminary paper) to a jury of faculty members. The two or three following years are devoted to full-time research and to writing the dissertation. Students are given the opportunity to mature and develop their economist’s intuition and techniques. PhD students participate in the life of academic groups, including seminars. They also present their research work in junior seminars and international conferences and are encouraged to participate in specialized summer schools. Our PhD program is designed to prepare our candidates for the International Job Market. May 2nd to 22nd 2019: applications for Bachelor's degrees ( (applicants with a French or a froreign degree) and Master's degrees ETE (applicants with a French degree). Our ambition is to keep attracting the best students in the world. Therefore, we offer financial help for our future PhD students. 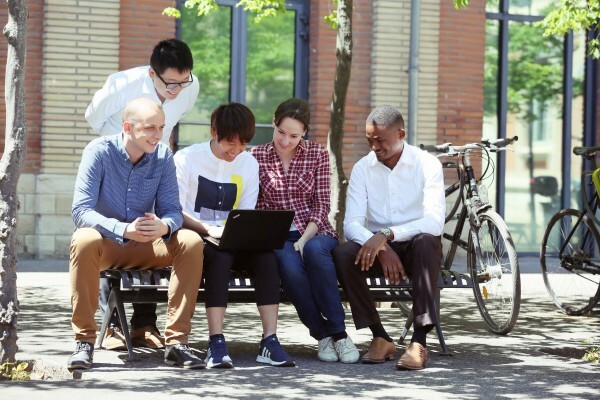 Once the students graduate from the Master 2 ETE and continue in the PhD program, the doctoral school makes sure that they receive funding for four years. Some positions of teaching assistant and research assistant are also available. It usually takes 5 years for students to complete their thesis. "TSE is a very good environment for research. Besides the faculty helping students, much administrative hassle is kept away from students to be able to better focus. In any given week there are more research seminars than one can even attend, so one is exposed to many different ideas. Throughout my time at TSE I enjoyed substantial financial support, both for my living expenses as well as for accessing data"
"TSE is an amazing place for students who want to devote themselves into research. The professors here are very productive and nice. Their love to economics is so contagious. There are so many conferences, seminars, and workshops in diversified areas that could feed your interests and tastes. The quality and quantity of those meetings are fabulous. Overall, our PhD program in terms of its research environment is comparable to the top-ten programs in the US. The life at Toulouse is also very rewarding. You would meet many interesting persons here. International students' background are diversified and they come from five continents. I love here so much and miss the people I met here. You would never regret if you choose to come to TSE." "Learning how to become a researcher is not an easy task and TSE's structure in thematic groups played an important part in helping me develop research skills. Every week, we had a macro seminar with external speakers, a macro workshop for PhD students to present their work and a macro reading group where we discussed recently published papers ! When you present your work, comments from professors and fellow students can be tough to hear, but that's how make progress and learn how not to cut corners. Overall, the environment at TSE showed me a passion for intellectual challenges that was contagious. I felt encouraged to play my part and contribute, as an economic researcher, to a better understanding of the forces driving our economic system." "TSE gave me an outstanding training in econometrics which was crucial for the beginning of my career. I believe that the scientific environment at TSE is comparable to the best economics departments in the world. Just look at the amount and quality of seminars, workshops, and conferences hosted at TSE each year and compare it to any other top economics department. There are more events than you can digest!" "I enjoyed the diversity and academic environment here. Students and researchers are coming from all over the world and doing research in various fields, each contributing in a unique way to the diverse culture here. The research environment is of first grand; each year, top researchers around the world visit and give talks at Toulouse, giving us plenty of opportunities to be exposed to the research frontier. The researchers/advisors are really great economists and patient teachers; discussions on our work are usually deep and focusing on the big picture and economic applications, which I find are the most important part of economics research. Of course, the city is truly beautiful! Some deals are too good to be true but TSE defies this adage. One gets to live in a great city and have access to one of the best economics departments. TSE has a big PHD program with roughly 20 incoming students each year, which makes you feel like a part of the community. I was part of the Macro group and learned a lot through interactions with the faculty members and other students. And this interaction was not just limited to internal members as the PhD students interact a lot with the visiting seminar speakers (and there are a lot of them at TSE!!). In terms of the timeline, one spends the first two years on coursework. The core courses are interesting and give a good foundation for research, both in terms of material covered as well as to develop research agenda. I got good support from my advisor as well as other faculty members to keep my work on track throughout the PhD. For the job market, TSE has a professional team of people, comprising of staff members and faculty, who help you throughout the job market season. The hard work that TSE puts in to prepare its students is amply reflected in the placements!!" "I did my Ph.D. at TSE from 2011 until 2016 (plus a strong M1 a year prior). Coming from Peru to Europe for the first time, a lot was new, exciting, and different. Language-wise, for instance, classes were in English, while daily life was in French. To make this harder, coursework at TSE is tough and exams are intense. However, I can say with the benefit of hindsight, that such level of rigor makes TSE alumni well equipped to face the challenges of a dynamic world. At TSE, I learned to always stay curious, and to study seriously and committed to the subject at hand. After the Ph.D. I came to the U.S. to work in consulting. My adviser and other faculty members were always supportive of my choice and were instrumental for me finding a job in Washington, D.C. There, I have confirmed that TSE enjoys an outstanding reputation in economics, especially in IO. All in all, my years in Toulouse were some of the best in my life, I am deeply thankful to the school, the administrative staff, the faculty, and my friends!" Doctoral students who enrol in the ENTER programme spend between three months to a year in one or two of the network institutions where they benefit from exactly the same status as the other doctoral students. Depending on their situation, they may either attend classes or seminars, or work on their thesis under the supervision of one of the university’s professors. They are thus in contact with a wider teaching body and a more diverse range of research themes. They can also develop productive professional relationships with other students and thus become truly European economists.